When you ask an audience member to describe a ballet studio, the first few things that probably come to mind are; mirrors, ballet barres, pink tights, pointe shoes, tutus, music etc. The first thing that I say to describe a ballet studio? A pungent smell of feet, hard work, and sweat – clear evidence of getting performance ready. While we don’t often open our studios to the public for rehearsals, we invited the community to experience what our studios smell, look, and feel like during a full cast open rehearsal this past Saturday. The studio was full of dancers, students and professionals, and interested spectators. Thank you to all those who shared their day with us! Company Artist Anna Roehr as the White Rabbit during Nutcracker in Wonderland Open Rehearsal of December 1, 2018. Now two weeks away from our first performance, the rehearsals are intense, focused, and long. I am reminded of a number of things I had to learn as I transitioned from a student to a professional, and a number of things I have had to learn since the beginning of Ballet Co.Laboratory. Some of these lessons are quite special. Zoé, as Artistic Director, does an exceptional job conducting these full day rehearsals in an organized manner. As company dancers, we try our best to stay on top of our game and guide the students to the next learning lesson. I often forget that the “homework” piece - as Zoé refers to it - comes as a habit to me as a professional, but as a student, it did not. After rehearsals, it is imperative to write down my choreography, corrections, and notes; I listen to the music; I review my parts each day; and then I learn what is happening around me so that I am prepared for the next scene, dance, or movement. I have now almost forgotten that I had to learn how to do this as a pre-professional. I vividly remember having trouble remembering choreography, hearing counts in music, and forgetting what comes next. This is one of the biggest differences between student and professional. As a professional, I think it is important to remember how this process developed so that we can help others grow and develop in this skill set. It is also important for those of us who are professionals to remember that this learning does not stop, some are better at this than others, and one that requires continual improvement, as there is always something that we miss. The Company and upper level students enjoy the Mad Hatter’s tea party during Act II of Nutcracker in Wonderland during Full Cast Rehearsal. (b) in collaboration with other roles, many of which are students. As a Party mom, I am responsible for my three “daughters,” but I try to take particularly good care of my tiniest party girl and I make a mental note of where she needs to be and when. In the Snow Waltz, the company pairs up with a student who is their ‘opposite’ dancer on stage. The company dancers each work individually with our student dancer on corrections, timing, and steps. In the Caterpillar dance, a trio of professional dancers weave in and out of younger dancers throughout the second act. It is through the side by side dancing and coaching that offers ongoing mentorship of our students and is an integral part of their dance training. It also helps us all make sure we know the choreography and what comes next, and enjoy the experience as a company in the presence of a great school. I remember being a pre-professional student and having trouble in large rehearsals or putting a show together, and the best way to learn how to do it, is to do it. But “doing it” in the presence of more experienced dancers enriches the training and memories and hopefully the final performance. Company Artist Michelle Ludwig as Rat Queen in the battle with Patty and Clara. See her fierce character come to life complete with claws, ears and crown! 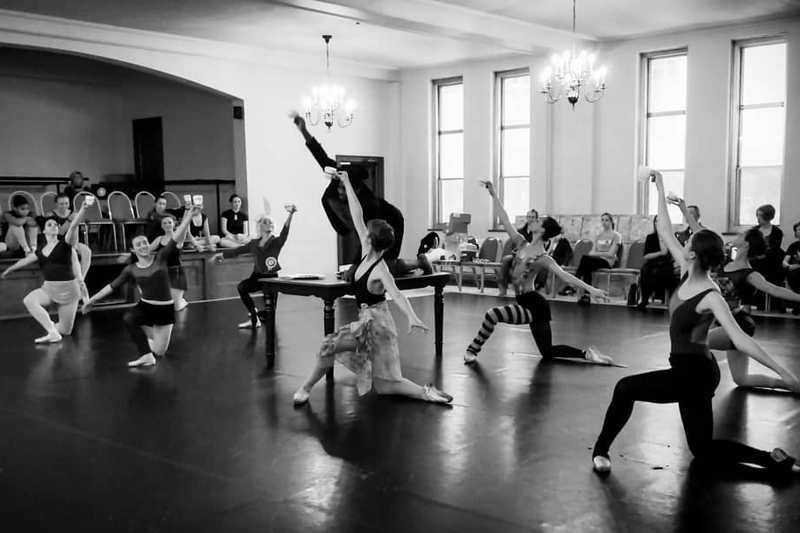 This past weekend we had a great number of visitors to Ballet Co. Laboratory’s open rehearsal. It was exciting for professionals and students alike, as this was the first view of the premiere of a new show. It was also the first time the entire show was danced in its entirety. It was a reminder to me how many sides there are to being a professional with the company; dancer, role model, teacher, mentor, peer, and many more that I didn’t mention in this post. Thank you again for all your support and excitement surrounding Ballet Co. Laboratory and Nutcracker in Wonderland, see you in a few weeks!